Smart 2200NET Rack Mount 2200VA Intelligent Network UPS System includes Automatic Voltage Regulation (AVR) and provides intelligent, line-interactive battery backup for networks and servers. 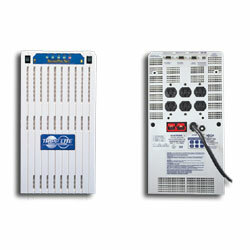 2200VA of battery backup allows you to work through short blackouts or safely shut down during longer ones. Includes Tripp Lite's PowerAlert Software and Cabling compatible with every brand of UPS, from every manufacturer to provide power condition reporting and enable Automatic Unattended System Shutdown both locally and across a network.